Ethics is the philosophy of action. So part of its domain surely therefore includes, the philosophy of inaction. 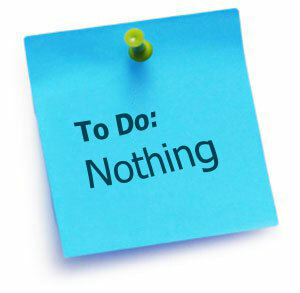 And this is a defence of doing nothing. But there's so much to be done! How can I defend inaction in a world with so many inequalities and injustices that plague our lives? My answer? For precisely that reason! Precisely because so many are raging at inevitable inequalities and injustices which will forever plague our lives. "The world is getting worse." "Read the newspapers, listen to the news!" "Why would we believe a source that we accept is biased, one that revels in telling 'stories', one that looks for the buttons to press to get likes, shares and dollars?" Actually, the world is getting better, much better. So, we may not know, overlook, ignore or even blatantly deny that the lives of living humans today are in most ways degrees of magnitudes better that what they they were 20, 50, 100 years ago. But asserting that it isn't so does not make it true. What is true is that despite all these improvements, there are areas where further improvements can be made. But there's another truth, a rather more insidious truth. Despite the improvements, we are still full of concerns. Our minds continue to be agitated by the many risks and harms and injustices and threats to human life, health and flourishing - even while it has probably never been as good in human history. Why is this? I suspect that our minds are programmed to worry - or at least, to preserve a space for concerns. We are predisposed to fill our quota of concerns. If we do not have any serious concerns, we will fill up the bucket with less serious, even trivial, concerns. So cool it on the concerns! Despite the improvements, it is evident that our outrage at the slings and arrows of fortune are no different than they have ever been. "Things are maybe even worse today" we are inclined to say, but that is perhaps just the signpost that sits above our perpetual pit of concerns. It reflects an instinct that is encouraged and reinforced when we yell into an echo chamber which operates like a lunatic rave with reverberating noise driving the dance of the outraged. Our outrage, frustrations, indignation and righteousness goes on and on. And gives rise to so much anger, so much rattling of sabres by the soldiers of righteousness, the ululations of those that grieve for the injustices committed against others. We still have corroborees, hakas, and witchhunts, it's simply that the names and the targets have changed. Fears, concerns, worries remain; what has changed are the things that make us fearful, concerned and worried. What was once ignored, or unnoticed has now come into view. What was once trivial is now top of the fears. This is concept creep and it "runs the risk of pathologizing everyday experience and encouraging a sense of virtuous but impotent victimhood" (Haslam 2016). But maybe the world is better due to our concern! So if we accept the world is better off than it was (despite the weirdly wistful view seen through milky eyes and dim memories), might it be because of all this concern, fear and outrage? For instance, the drive to reduce inequalities has been a phenomenally powerful force that has seen enormous movements to reduce the injustices suffered by children, workers, women, and various races. The situation today is not perfect by any means. But the progress on reducing injustices has been astounding. Whereas the original rallies sought to quell tidal waves of injustice, the loud bellowing today seems to be aimed at the ever, ongoing ripples of injustice. And is it just me, or does it seem to you too, that we focus on the ripples in our own ponds rather more than the tsunamis that affect the lives of others - both metaphorically and literally? A concern for others is a good thing, a morally proper position. It seems innate, and regardless of whether philosophers find a reason for us to be moral or not, we most of us feel the pull of moral constraints. We do not all feel the same constraints to be sure, but we do share a moral compunction to meet what we experience as our own obligations, and to provide care and support for kith and kin, and maybe others. So the drive to resolve injustice isn't going to go away. The injustices may get smaller, but the noise will remain the same. The challenge is knowing what to do. And maybe, just maybe, the solution is to just do nothing. At least for now.